Brochure pour The Energy Roundtable. « The Energy Roundtable is a private sector forum that was launched in 2004 to help define the Canadian energy sector’s role in domestic affairs and international oil and gas markets. Founded by the Canada Europe Roundtable for Businees, a transatlantic free trade advocacy group ». « The Canada Europe Roundtable for Business is dedicated to creating business opportunities between Canada and the European Union. Founded in 1999, CERT develops company-member interests by contributing recommendations on trade and investment to government officials and hosting thematic, high-level meetings focused on developing strategic relationships between company executives as well as with government officials ». Création du logo et réalisation de panneaux pour CEV (Centre Européen du Volontariat). 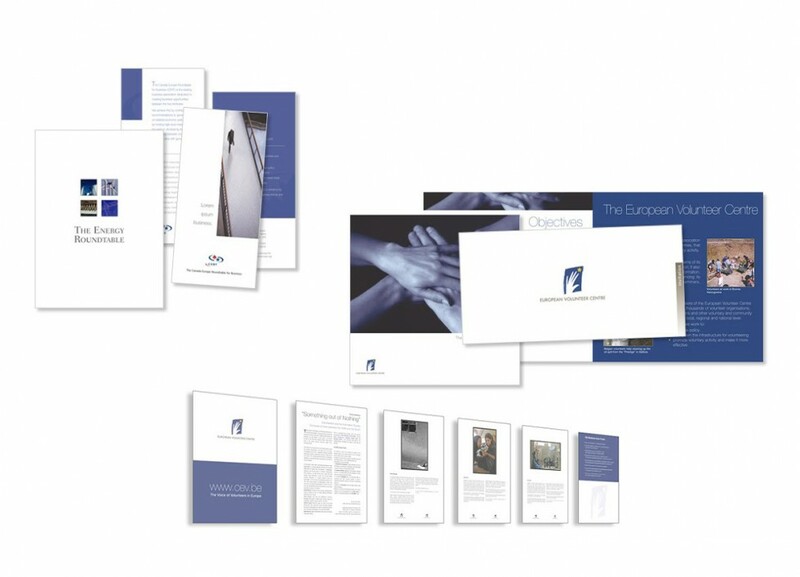 « The European Volunteer Centre (Centre européen du volontariat, CEV) is the European network of over 80 national, regional and local volunteer centres and volunteer support agencies across Europe. Through our network we work together to promote and support volunteering through advocacy, knowledge sharing and capacity building & training ».